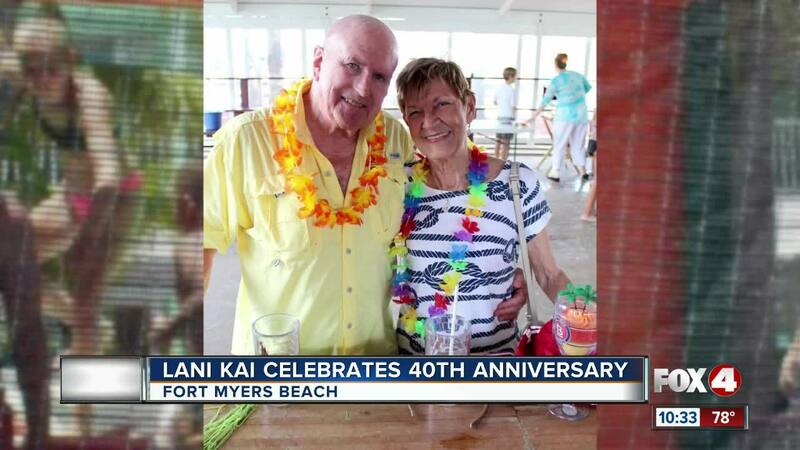 FORT MYERS BEACH, Fla. --- Lani Kai Island Resort celebrates its 40th anniversary with a party for local residents Sunday afternoon. Families flocked to the event to enjoy a cookout with hamburgers, hot dogs and cupcakes. The celebration was held at the resort, with most of the party taking place on the Key West Patio from 1 p.m. to 4 p.m. The event was family-friendly and included face painting, balloon art, magic tricks and a bounce house for kids to enjoy, along with an arts and crafts table. "I want to thank everyone for coming out to celebrate with us today," said Bob Conidaris, owner of the resort. "It's each and every one of you that makes the Lani Kai what it is today -- a fun place to be where you can come and relax, have fun and enjoy Fort Myers Beach." To commemorate its 40th year in business, residents can purchase limited edition reusable plastic cups, T-shirts dedicated to world famous rum runners, and signature T-shirts from Val's Miami Blue signature frozen cocktails. Throughout the years, the resort has become known as "Spring Break Central" and is one of the Top 10 spots to celebrate Spring Break in the state of Florida.